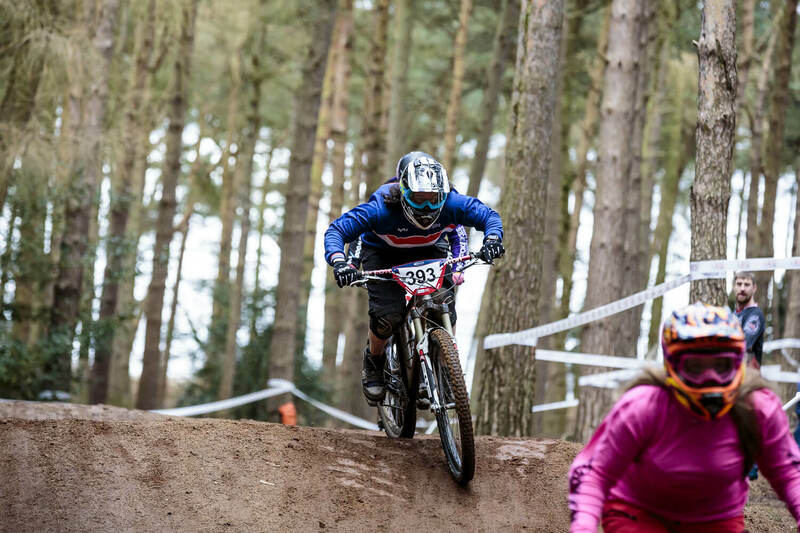 First race of the season, first time at Chicksands, first time meeting the Flow MTB crew and first time in the ‘old ladies’ National Champs jersey. It was to be a weekend of new experiences. Chicksands was slightly damp, enough to hold the sandy soil together well and make it nice and grippy without becoming a slippery slidy mess. After a few quick hellos and taking the husky for a wander I was straight out on the 4X track: Fast and flowy with some great corners for overtaking I knew from the off we were going to be in for some great racing. I spent a while trying out some different lines before testing the Dual Slalom with Anita from Flow MTB, definitely gets my vote for shits and giggles with your mates. In true 4X fashion after dialling in the lines the next stop was the local pub before dinner and a good night’s sleep. It was a bit weird not having the traditional campsite by the race track, but I was pretty tired after the drive and happy to get an early night. And so, it was race day… I struggled to stick to the gate in my first moto and ended up with my foot down when the gate dropped, not the best start to racing. The next 2 motos were fast and furious, I got good starts, but young Megan Wherry was off like a shot and she wasn’t leaving any windows for overtaking, Courtney Abbiss was hot on my tail ready to take advantage of the slightest gap and you’ve always got to watch little Miss Escott for a sneaky move. On to the final… out the gate… Megan was on the far side… Courtney and Hannah in the middle… neck and neck into the first jumps. I tried to get an inside line on Megan in the S bends but she shut me out leaving a gap for Courtney to make a move. It was full on the gas trying to nudge a wheel ahead into the second to last corner. I tried another sneaky move on Megan but she was having none of it, luckily I managed to maintain my speed and stay just ahead of Courtney and Hannah to take 2nd place. It was so good to be back in the 4X world, catching up with old friends, heckling and cheering during the other races, watching some epic moves (and crashes). Such a great form of racing where everyone is chatting until you step into that gate, then it’s ‘take no prisoners’ until you cross that finish line for fist bumps, high fives and hugs. Bring on round 2!